Freshman Jennifer Lai, Senior Serena Ringfeild, Freshman Ayana Stewart, Sophomore Isabella Araogza, Freshman Audry DeMeres, Freshman Adrian Contreras, Sophomore Emy Mosnier, Junior Evie Stephanos, Junior Chloe Adolfo, Senior Sasha Gatpandan, Junior Juliana Bates, Sophomore Haliey Kramero, Junior Samantha Kern, and Junior Elen Poretsky (left to right, top to bottom) pose at the beginning of their routine. 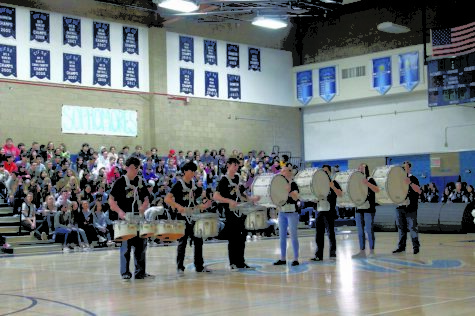 On March 10 and March 16, UC High’s Color Guard traveled to La Costa Canyon and Mission Hills, respectively, to compete against Bonita Vista High, Great Oak High, and Fallbrook High. 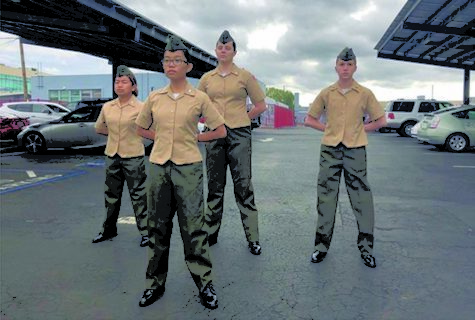 Color Guard Coach Greg Humphrey stated, “The team’s biggest strength is their equipment skills; they do some of the most challenging, intricate choreographies in the area,” said Humphrey. Members of the team still believe that there is always room for improvement. According to Junior Co-Captain Kaitlyn Thompson, “We can all improve on staying calm when things go wrong and getting back in.” Thompson has been a part of the Color Guard Team since her freshman year and hopes to impress the judges with her and the team’s performance. Senior Co-Captain Lauren Hosmer has been a part of color guard since eighth grade. Hosmer also believes there is room for improvement in the group. “As a team, we could improve our scores by practicing more outside of our scheduled times,” she stated. Junior Co-Captain Juliana Bates added that as a team, they plan to do their best and keep improving from their previous performance. Bates has hope for these upcoming competitions and thinks there are some things that could be improved. 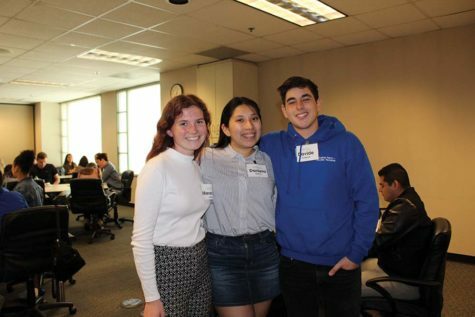 “It’s crucial to show the judges that we have equipment skills, as well as performance skills, and maturity, all while having fun,” she explained. Each member on the team plays an important role and makes the color guard family so successful. “Everyone has their own skills and assets to the team, but overall, I think we could all definitely work on our faces and how we move and project ourselves during the show,” Bates added. The Color Guard Team is hardworking and proves themselves with each performance. 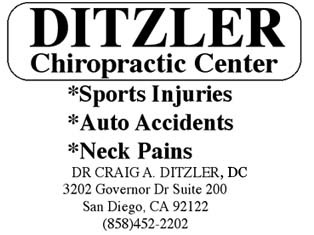 “This week is no exception. We hope to walk off the floor with a feeling that we tried and did our best,” said Bates. 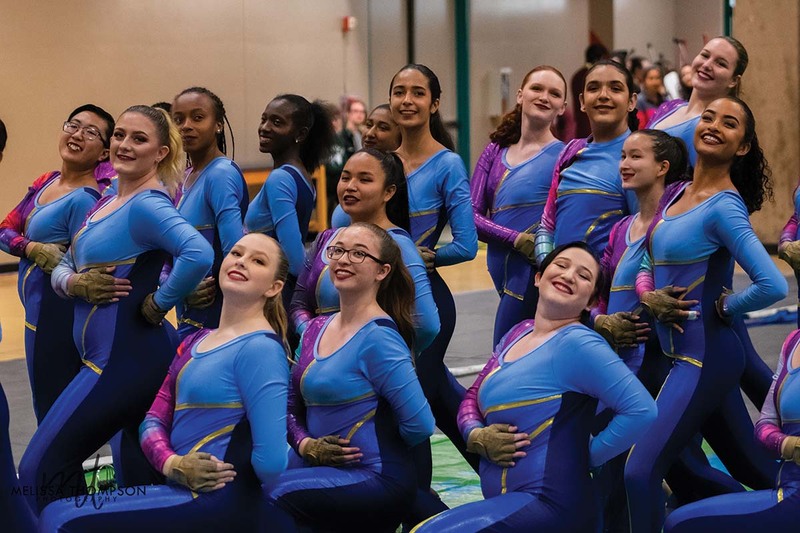 “I like the rush of adrenaline right before we get on stage and then, in the middle of performing, realizing how wonderful being in color guard is,” said Lai.